Use this Rubber Blower to blow dust out of mortises before gluing. It's also great for cleaning delicate electronic equipment. 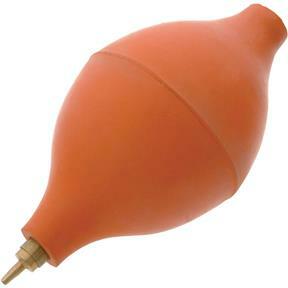 A brass nozzle aims a fine stream of air while a one way valve draws clean air into the bulb from the opposite end. Overall length is 4-1/4". these bulbs are better than infant nose-snot removers for testing the integrity of aircraft fuel tank vents. although the tip is designed for velocity, the volume of these helps assure that the vents are functioning as part of a pilot's preflight. I give them away to every aircraft owner for whom I perform an annual inspection, and as I often hear: "wow no one's ever checked that before!..